All Decked Out, indeed! 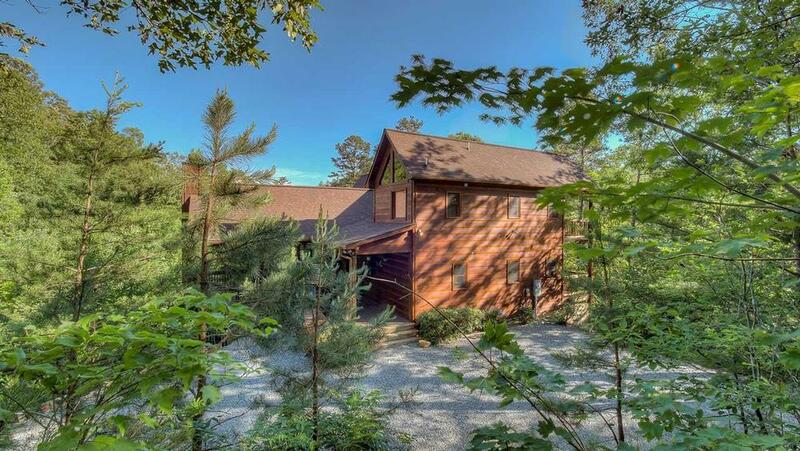 This spectacular Blue Ridge cabin rental boasts two huge wraparound decks, perfect for entertaining outdoors or simply enjoying some quiet solitude in nature. A feeling of relaxation will take over you here, where you're surrounded by nothing but nature's beauty. This cabin's prow-front windows offer views of Mother Nature all year 'round, from the first buds of spring through a blaze of color in the fall and the chance flurry of snowflakes in winter. Its warm and inviting all-pine interior features rustic decor in warm earth tones and a casual elegance that will make you feel comfortable the moment you walk in the door. Spend the morning relaxing on the porch swing, reading or watching TV on the large flat screen TV in the family room while the kids have fun downstairs in the game room, playing foosball, pool or darts. 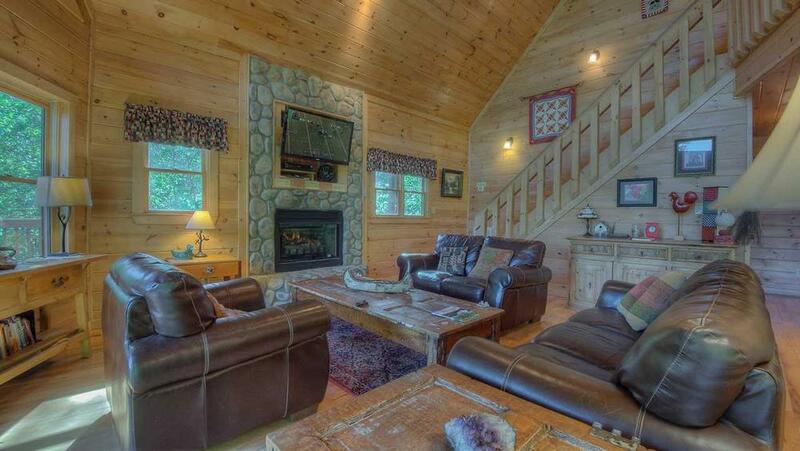 They can also watch TV in the game room on another large flat screen TV while curled up in front of a cozy fire. Once you're feeling refreshed and ready for some action, there are plenty of options to choose from. Head out for a hike or spend the day on the water, whitewater rafting or tubing. If shopping is your sport of choice, there are plenty of shops to choose from in downtown Blue Ridge, followed by a leisurely late lunch at a nearby cafe. Gourmet chefs will feel right at home in the ample kitchen, which provides dinner service for twelve and all the accouterments required, from coffee pots to wine glasses, a microwave, and a wide variety of cooking utensils, pots and casserole dishes. You can also cook dinner easily outside thanks to a gas grill and two charcoal grills, and there's enough room for everyone to eat out on the decks. In the evenings, lounge on an Adirondack chair or one of the multiple rockers with a cool drink enjoying the evening air. Then get out the board games and puzzles and have a family night inside or out on the deck. 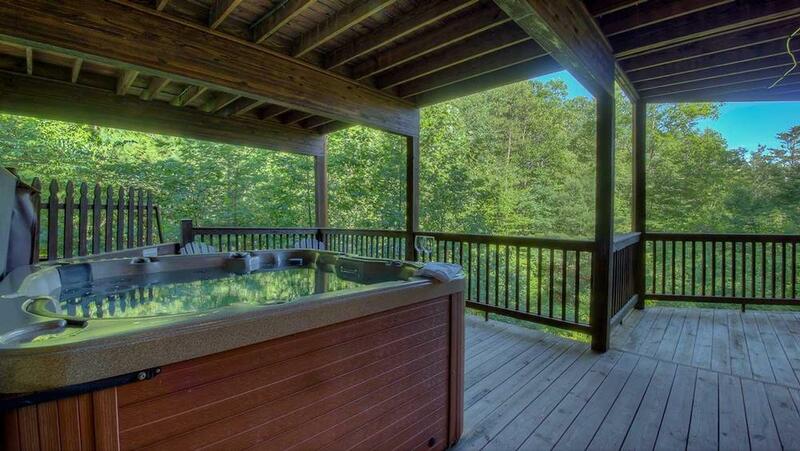 Finish the day with a relaxing soak in the hot tub. 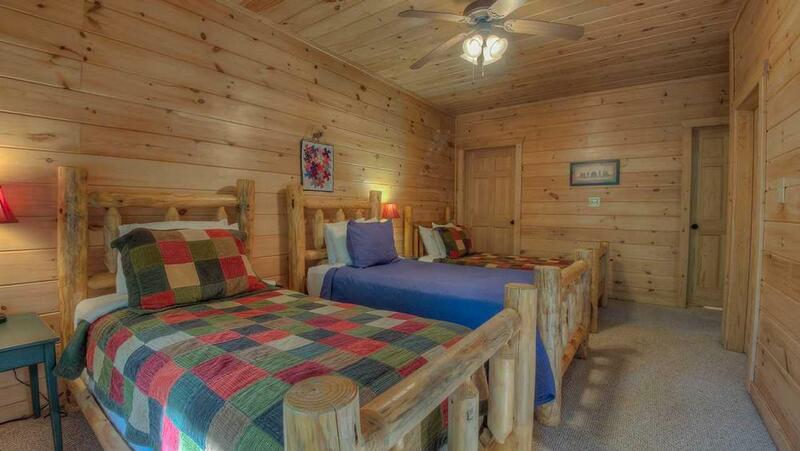 You can choose from three bedrooms or the loft, all outfitted with charming country bedding and rustic log furniture. In the queen master bedroom upstairs, see the stars through the windows of your cathedral ceiling or while you luxuriate in the Jacuzzi. Have your morning coffee out on your private balcony overlooking mountain views, or choose the queen bedroom on the main floor, which has deck access with seating for two. 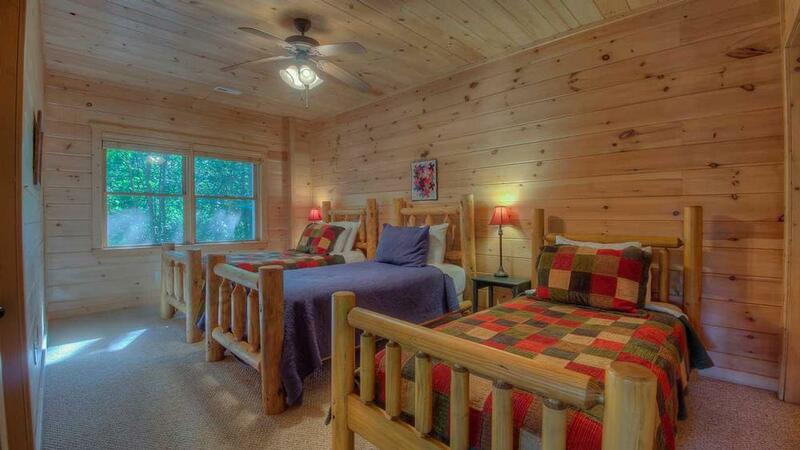 The kids can snuggle up in the downstairs bedroom's three twin beds or the twin in the loft near their parents. 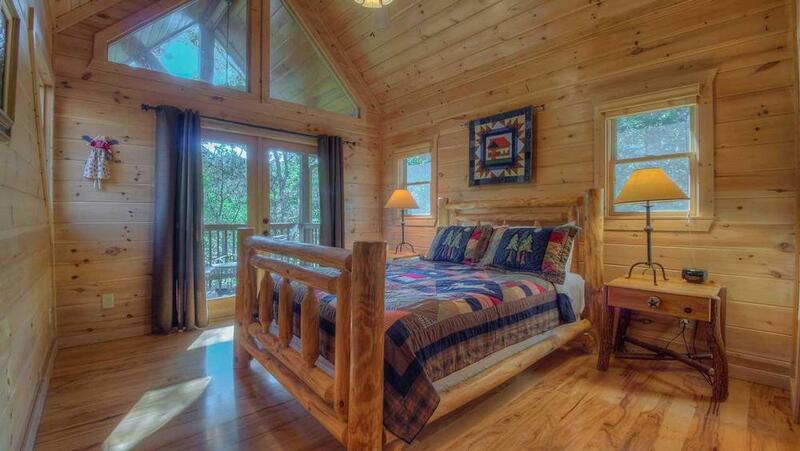 This is a cabin that's truly All Decked Out with everything you need for a great mountain vacation. Bring your favorite people to spend time with, and let the fun begin. 01/19 - The all around deck was amazing!!! 10/18 - Outdoor fireplace with ample firewood. With the leaves still on the trees this was a nice secluded home, which was great for us. 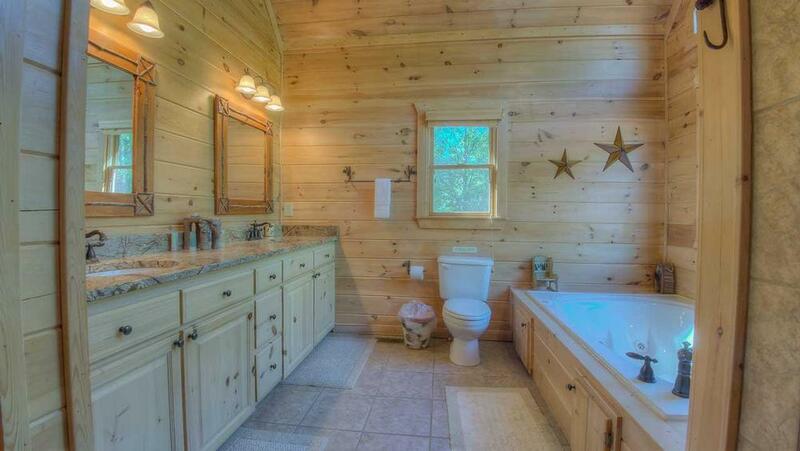 Nice "non-bear" decor, well-named for all the great decks. Excellent company, always love the goodies and info and the supplies are well marked. The "presentation" is always beautiful (towels, etc.). 09/18 - Nice home overall. Escape to Blue Ridge is a great company when it comes to customer service. I appreciate the quick responses to requests and the friendliness of staff. 09/18 - Quiet, peaceful. Excellent customer service. 08/18 - The home is immaculate....attention to detail is flawless. Great company and very responsive. 07/18 - Enjoyed the peace and quiet of the area. 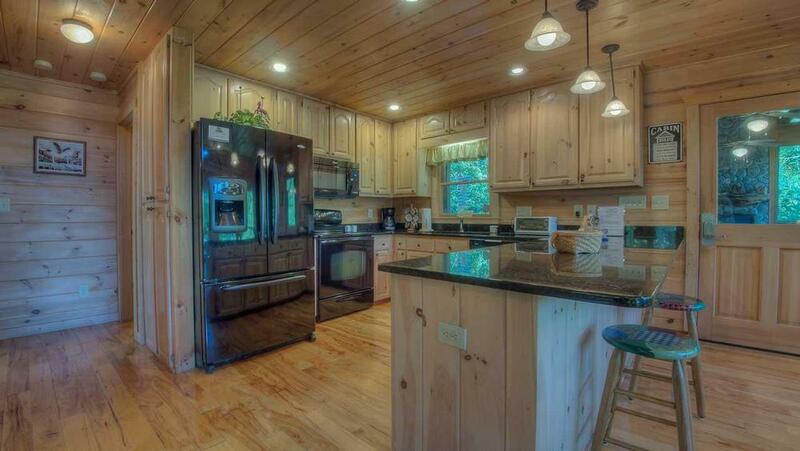 06/18 - This is a beautiful spacious cabin with all amenities you could ask for! 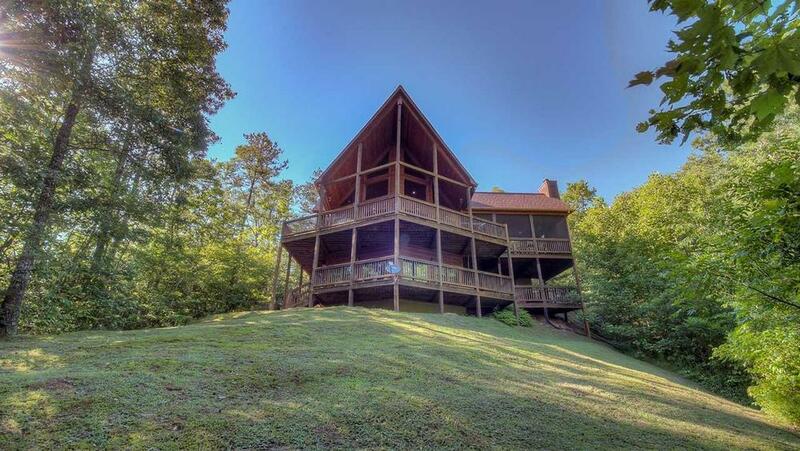 Perfect location and great for star gazing with the luminous glow of the fire flies. Would visit again. 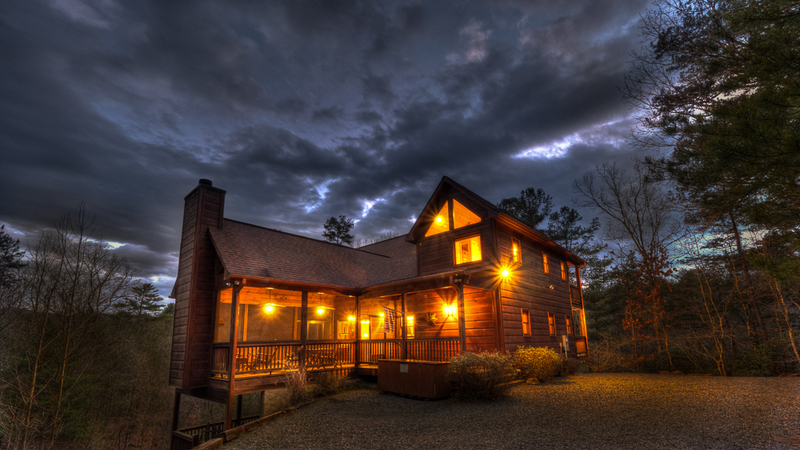 Escape to Blue Ridge company was helpful during the booking process and provided the confirmations and cabin information within a timely manner. It was simple, quick and we were comfortable during our stay. 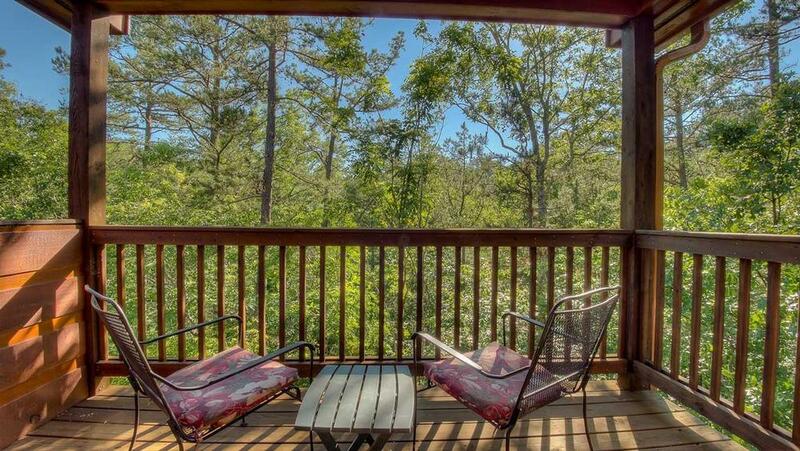 05/18 - The deck overlooking the woods was fantastic. Incredibly peaceful at this cabin, which is what drew us to Blue Ridge more than 20 years ago and continues to draw us to the area. I really appreciated how private it was. Escape to Blue Ridge is another reason we are drawn to the area. You all have been amazing each time we’ve used you. 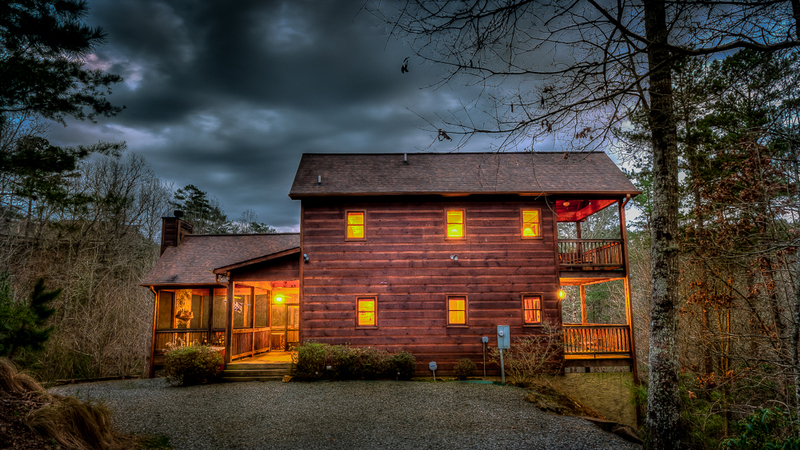 Great cabins and fantastic staff! 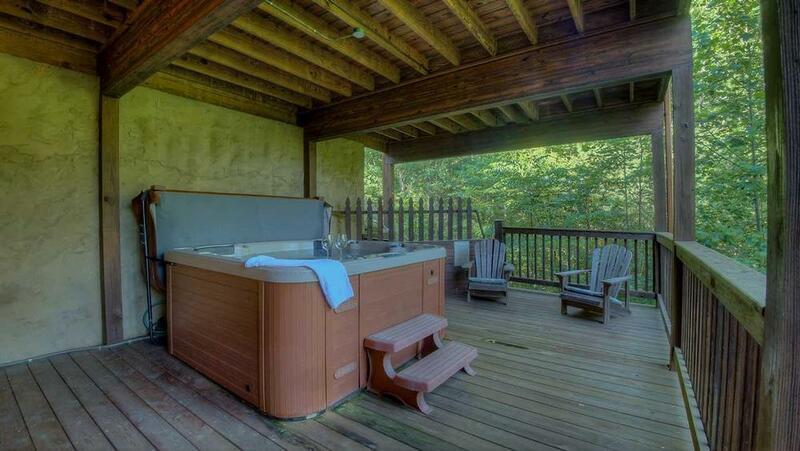 4/18 - Loved the foosball, pool table, hot tub, and porch fireplace! The company was great to work with, friendly and engaged with me. 4/18 - We loved the peacefulness, the trees, the sounds of nature. Great! 2/18 - The cabin was very nice. Had everything we needed and more. Tons of games and kitchen items. Very spacious. We had plenty of room for 7 of us! 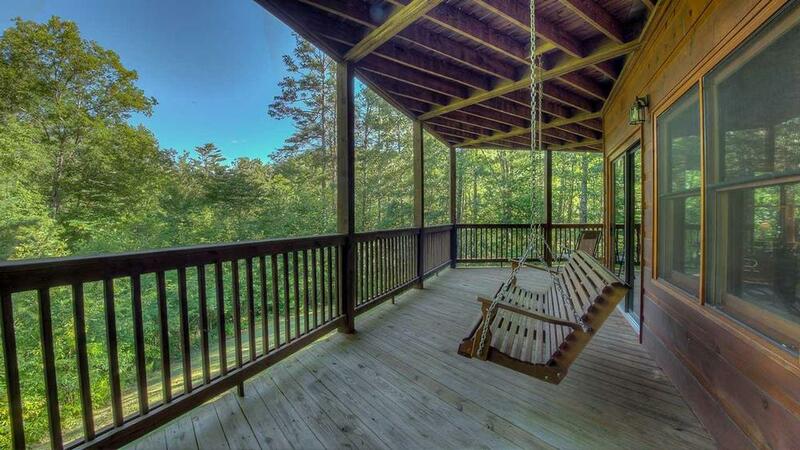 Tons of deck space. Everything was very clean when we arrived and we loved the complimentary lunch box with the goodies inside! 10/17- Spacious and very clean. I loved the deck and small backyard! I love your company. You are very professional and also accommodating. 10/17- Great space. Fantastic company. 07/17- The house itself was beautiful. We loved the community it was in, as well as the solitude of the cabin itself. 07/17- Beautiful home close to everything we wanted to do, but still tucked away on the mountain. Very clean and the kitchen had everything we needed. 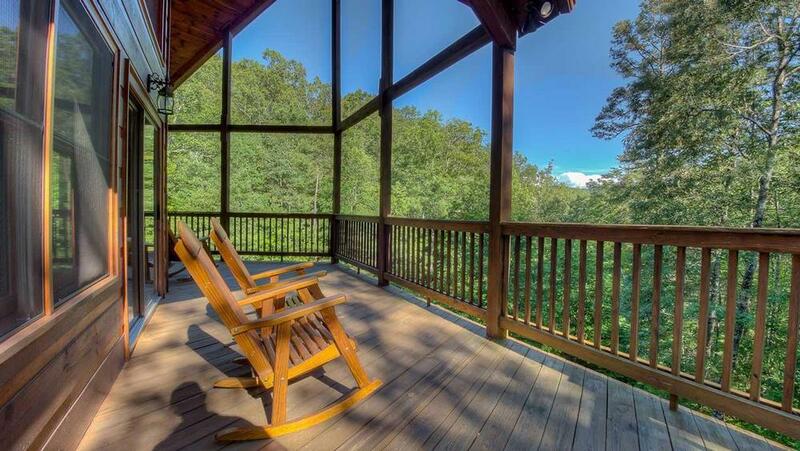 We loved the outside fireplace on the screened-in porch in the evenings and the other decks with chairs to sit and enjoy our morning coffee. Excellent customer service! 07/17- Enjoyed the seclusion. Very quiet. Very easy to work with, great property. 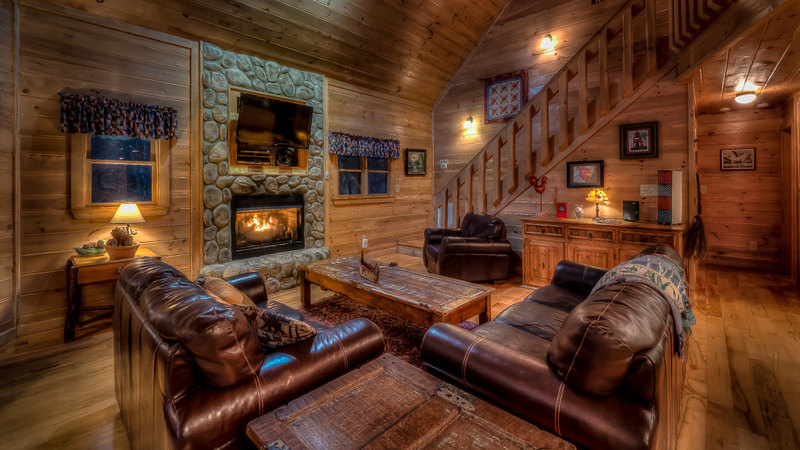 06/17- We enjoyed the home accommodating our entire family - the outdoor fireplace and game room were a plus. Also everyone having their own level to sleep was wonderful privacy for all, while enough room to gather as a family. GREAT! 04/17- We had a wonderful time! 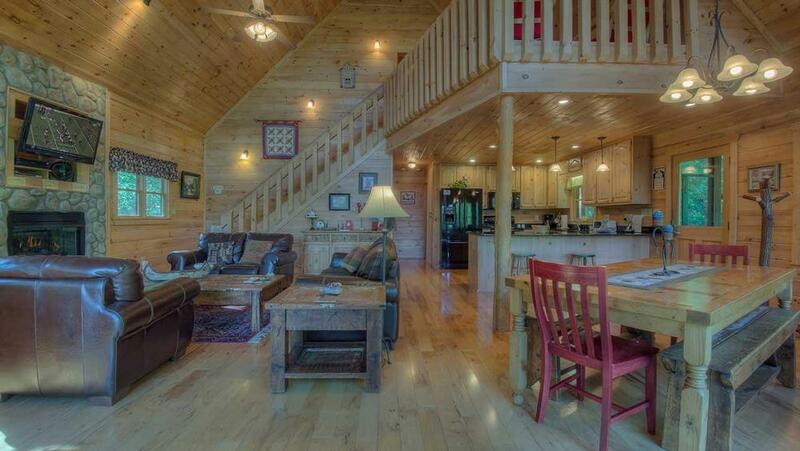 The cabin is perfect for a large family or 2 couples - great time! 03/17- My daughter and I just loved the outdoor fireplace! Also enjoyed how bright from all the windows. We've stayed at other cabins before, this is by far the nicest one! From the appliances to the cookware,utensils,dishes! The game room also very nice! I would definitely rent a cabin again, maybe try a different one next time! The young lady I talked to on the phone was very pleasant and helpful! 11/16- Its HUGE! Great place, lots to keep us entertained and literally decks galore. Great company to work with, easy to deal with, great communication, no problems with the company or the rental house at all. 10/16- The cabin was clean and in great condition. The decks/porches were outstanding. The staff were very cordial and polite and the company seems to be well run. 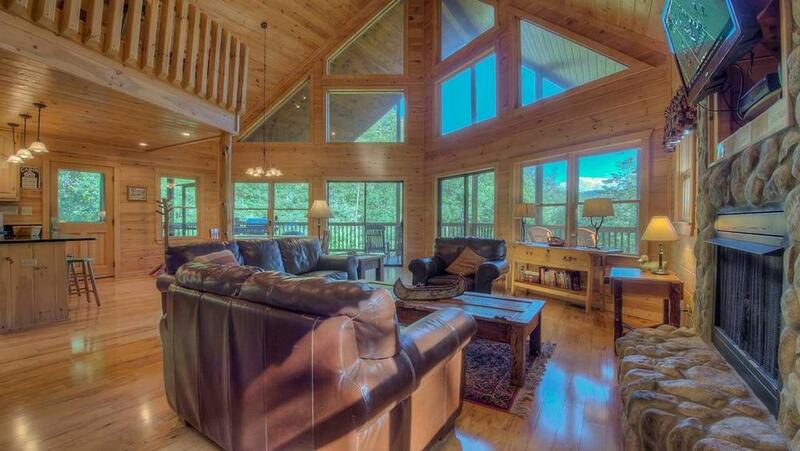 09/16- We loved the beautiful wood, the spaciousness and the three levels with a bedroom and full bath on each level. Since this was a couples getaway this attribute served well. The cabin really lives up to its name "All Decked Out". Simply beautiful. Very personable and professional staff! 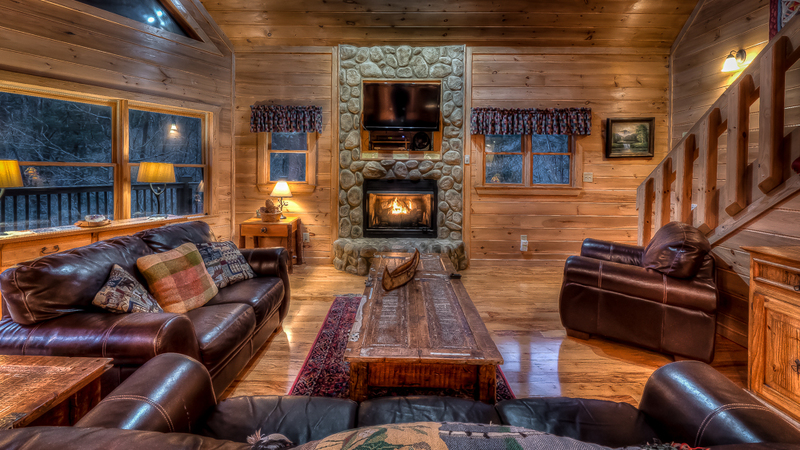 08/16- The attributes that I enjoyed were the peacefulness, the wrap around decks, the game room, the jacuzzi and most importantly, the layout of the cabin was absolutely beautiful. 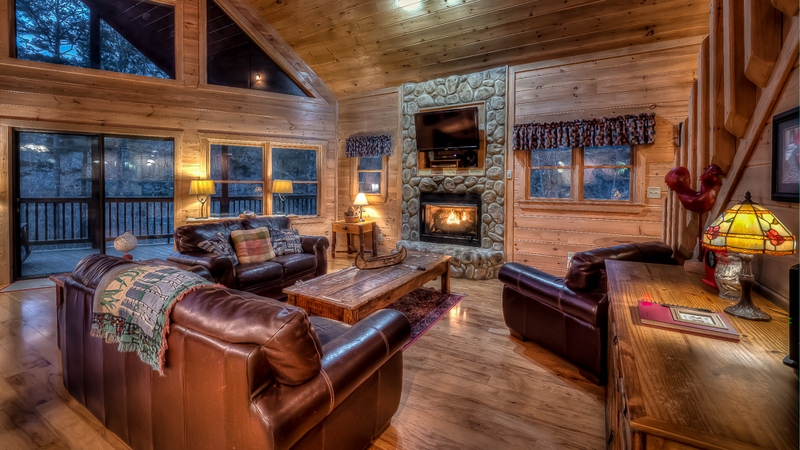 Escape to Blueridge is a wonderful and extremely professional company. I will continue to use this company for myself as well as to recommend to others. Excellent service provided. Well done! 08/16- We enjoyed the decks and enjoyed the game room in the basement. Company is very pleasant to work with. 06/16- The cabin was very private. 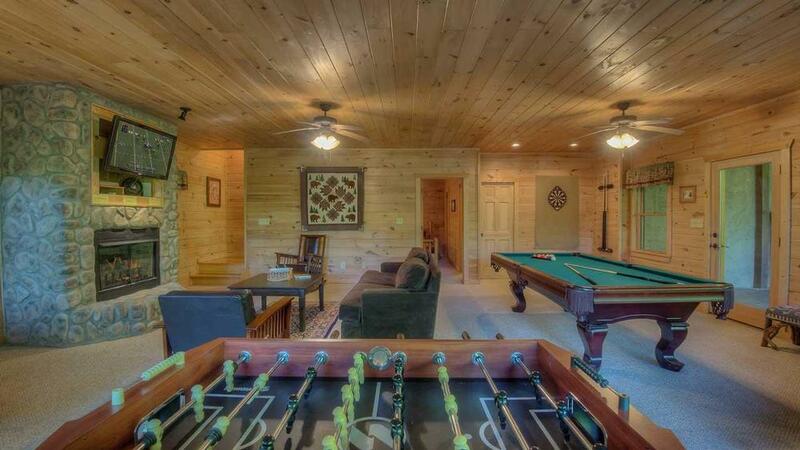 The game room (billiards, foosball and jacuzzi) were fantastic. The 3 levels of decks were very nice. The kitchen was nicely appointed. There were plenty of sleep accommodations. The large screen TV was enjoyed.The bath towels were great. The master bathroom shower (tiled) was beautiful. We like that it is pet friendly. 03/16- Excellent location and home amenities. Comfortable furniture and decor. Overall the house itself was very clean and inviting. Great value for our vacation. 02/16- Omg the master bathroom was amazing for me and my wife and also the games overall were well thought of.. Fantastic vacation! 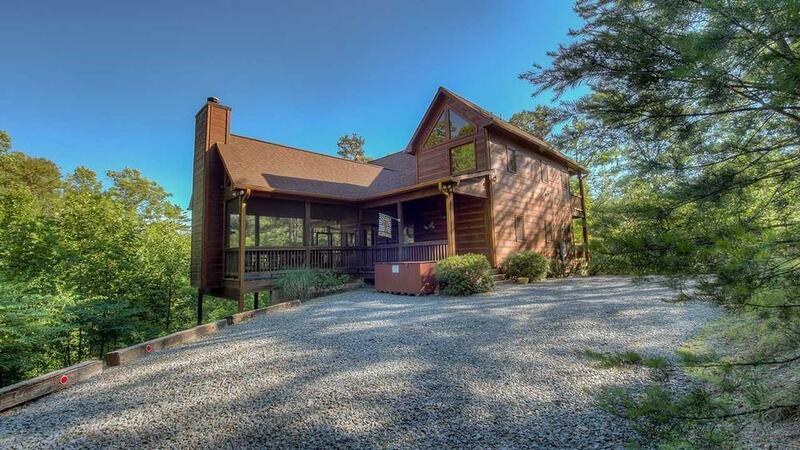 02/16- The screened porch w/outdoor fireplace; all the beautiful views from each deck; the great room that allowed for entertaining while cooking; the wide open glass wall allowing views/natural light; the game room and hot tub downstairs; the electric fireplaces indoors; the quality furnishings and comfortable beds. I think this is the third time I've rented through EBR and have always had a great experience. The online reservations make it easy to search/book a cabin and I recommend you to all my friends. 02/16- It was a beautiful cabin and had everything we needed right there. Will definitely stay here again. I enjoyed working with the company and will definitely use them again. 01/16- Private. Clean. Escape to Blue Ridge was very good. Fantastic and friendly customer service. 01/16- Loved the game room and the view was great. The company was great to work with I would definitely recommend and return. 11/15- We loved everything about the cabin. Love having a washer and dryer to use. The porch with fireplace was wonderful! Very friendly staff when we spoke and the cleaning staff did a great job. 11/15- The location in the subdivision remote, but close to stores. 10/15- The outdoor space is incredible, especially the amazing fireplace. While I would have preferred a view, the layout was so conducive to relaxing and enjoying the beautiful, quiet surroundings that we didn\'t miss it too terribly. 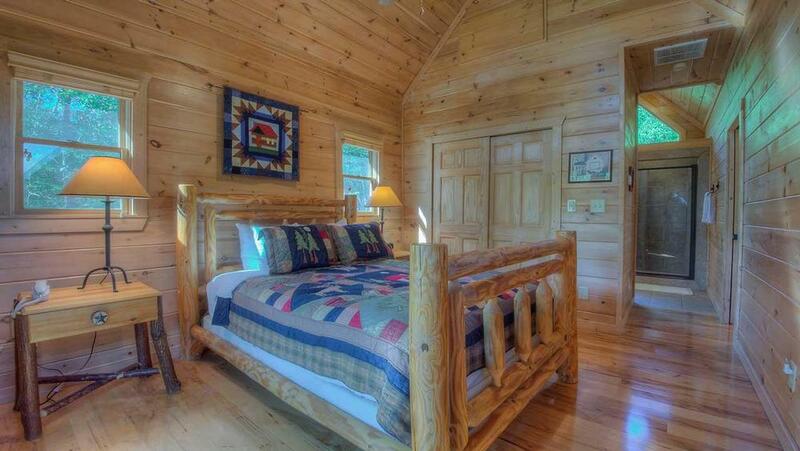 10/15- The cabin was exceptionally clean, attractively decorated, and well-equipped. 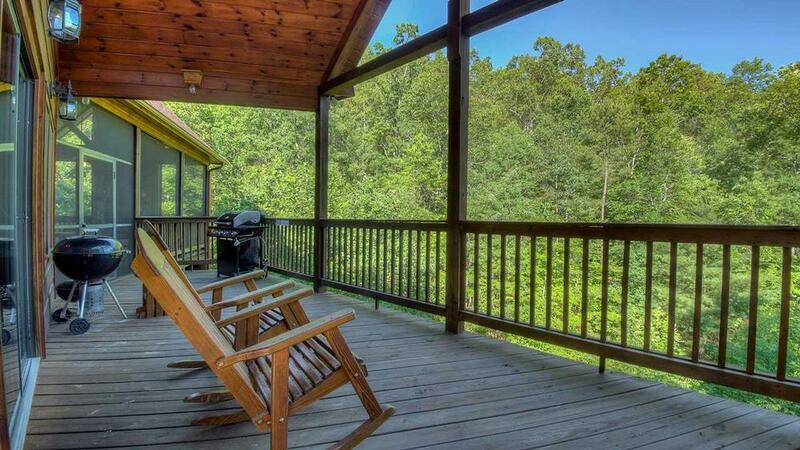 The screened porch and decks make it very pet friendly as all "escape routes" had a closure. The outdoor fireplace and dining area was very inviting and cozy. 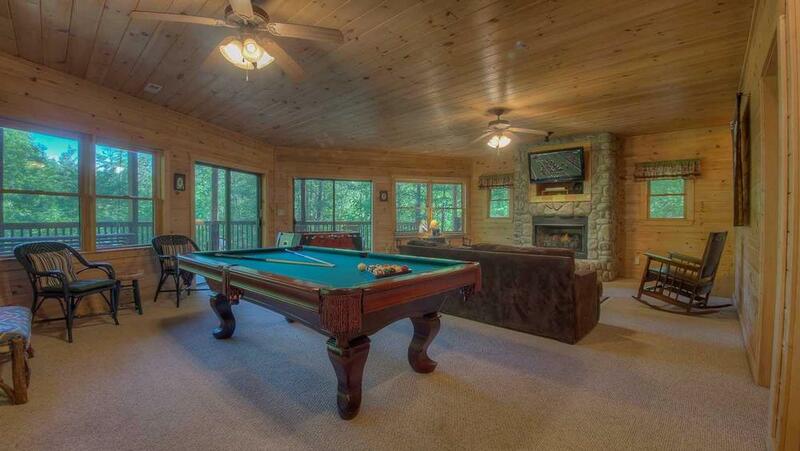 The lower level is a great entertainment area with pool table and tv. All conversations with your staff were courteous and all questions were satisfactorily taken care of. We will certainly use your company again. This was our third visit to one of your properties. 08/15- The home had lots to offer: pool table foosball(? ), games, media, hot tub. Lots of outdoor sitting--really enjoyed the fireplace. Plenty of dishes, pots, pans, etc. The setting was gorgeous and well appointed. 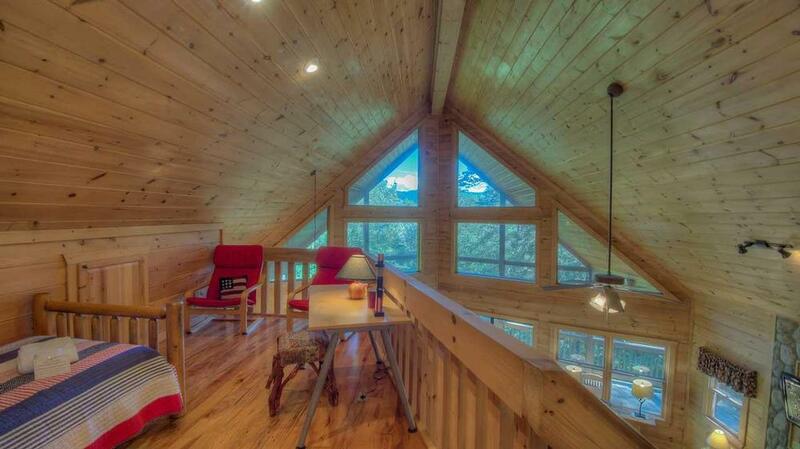 This is my second stay with Escape to Blue Ridge. All contacts have been excellent. We currently are deciding if we want to visit again over NYE! 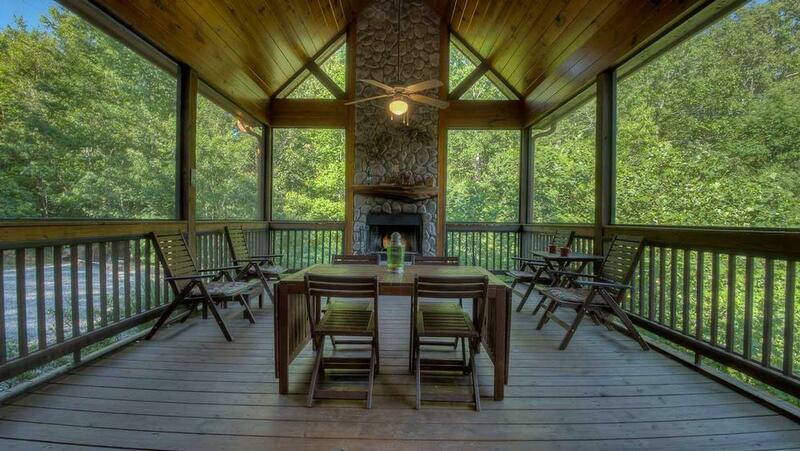 05/15- We really enjoyed the large screened in porch with the fireplace. Great service from the company. 02/15- The decks were our favorite. 01/15- Outdoor fireplace, decks, master bedroom were all favorite features. 01/15- The open floor plan of the living area and how it opened up to the screened porch with fireplace was our favorite feature. 12/14- It was nicely decorated and appointed. 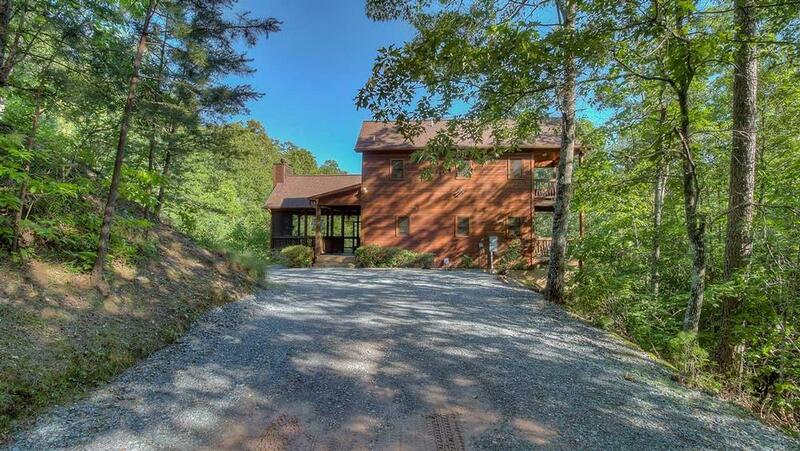 The home is located in a nice community and the house is quite close to the town of Blue Ridge. The space was more than adequate for 6 people. We found for the most part that the place was pretty quiet and peaceful. We saw deer in the mornings down in the gulley. We thought the furniture was pretty comfortable and the hot tub was enjoyed by all. The game room was spacious and nicely laid out. 11/14- Outdoor living space was fantastic. 11/14- The fireplace outside on the screened in porch and the layout of the cabin. 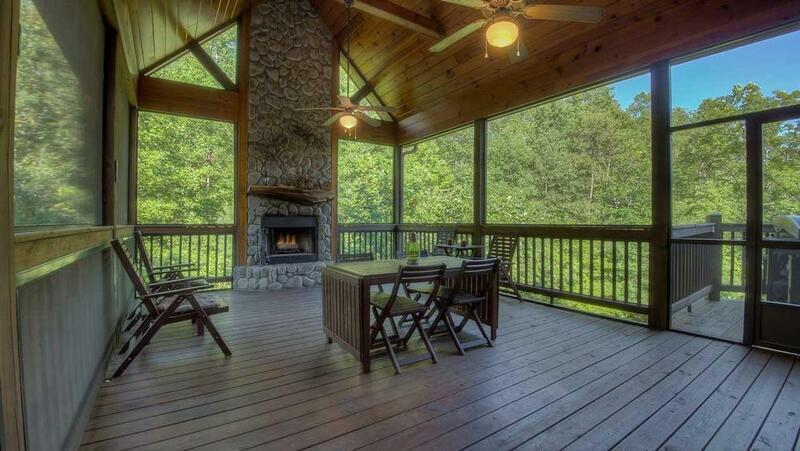 10/14- Loved the outside fireplace on porch;size and layout of home;newness and cleanliness. 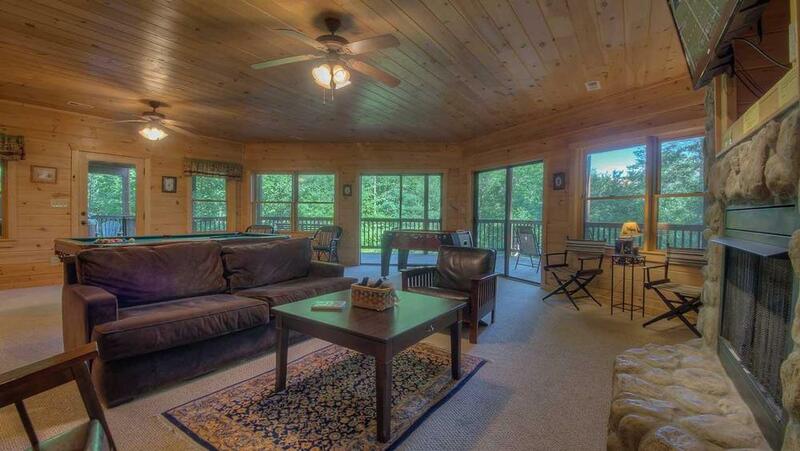 We have stayed with Escape to Blue Ridge several times and have been very happy. Homes are as advertized, clean and nice. Like that local lists of festivals and activities are sent to us in advance. Would highly recommend them, in fact we already have. 10/14- The screened-in porch with a fireplace, the decks that were contained with full railings and gates (wonderful for a dog or small children), the hot tub, and the table games.I love the amount of communication, reminders, newsletter and tons of information. All of this is so helpful. 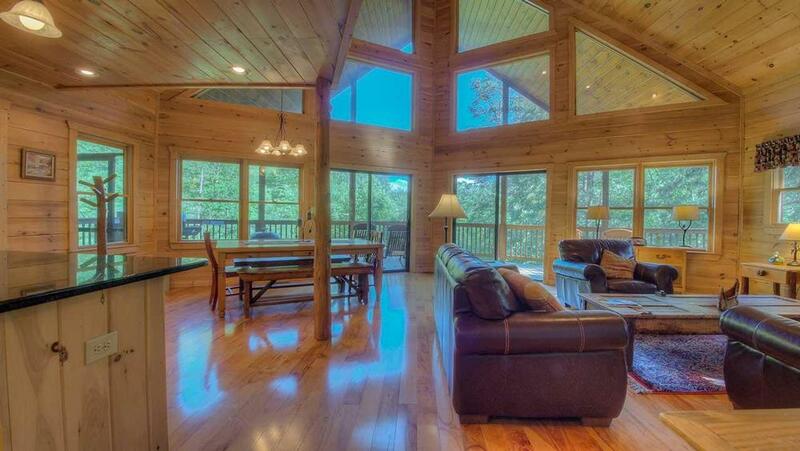 7/20/14 Very spacious, nice decks on every level, outdoor fire place is very neat, good game room and hot tub. Once you get to entrance to neighborhood it takes a few minutes to make it back to house. 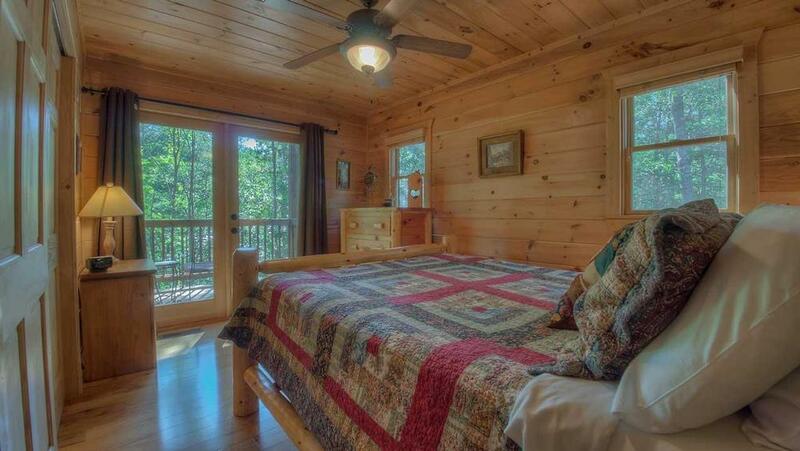 Very private and clean.Escape to Blue Ridge was so helpful with helping in decision on what fit our needs best. Have already recommended them to several people. We enjoyed the cabin. The wireless internet was spotty and did not work for us most of the time. It wasn\'t a major problem, but rather a secondary frustration. While the 10am checkout is understandable given you have to have time for cleaning, etc., it was frustrating. If possible, I would recommend you move that back an hour as it was difficult to get everyone up, cook and cleanup the kitchen, showered, and out the door by 10am. 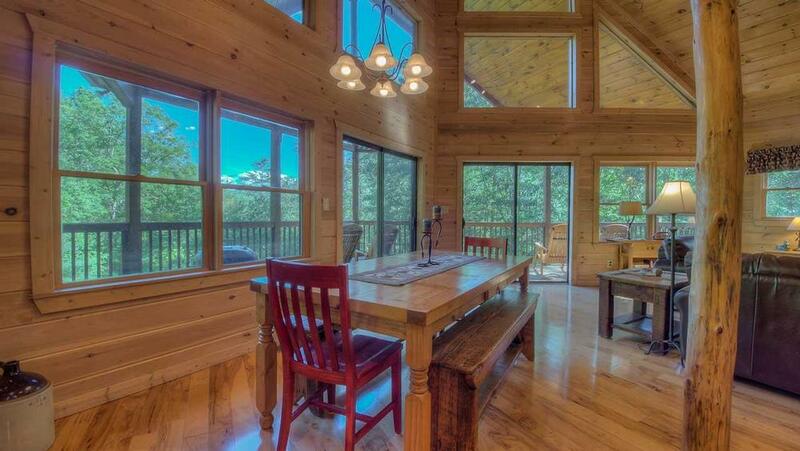 We loved the All Decked out cabin! It was spacious and comfortable. Well furnished. Spent a lot of time on the deck in the rockers. 06/18 - I thoroughly enjoyed everything about this cabin. We held multiple game nights during our stay and enjoyed cooking breakfast and dinner with each other. I absolutely LOVE Escape to Blue Ridge. I am a repeat visitor and so far my friends and family have really enjoyed it as well by booking their own trips.